This morning's Ithaca Journal includes photos taken at Bethel Grove Community Center in an article on contra dancing, which also notes that contra dances are held at 8:00pm every Friday for $5 at the Community Center. The Monitor reports that a parked car disappeared from Route 38 on Sunday night. On the opinion page, the Journal's editorial looks at unfinished business in Albany. I know I've been slack covering it lately, but this week's Dryden Courier surprised me thoroughly. Apart from a picture of scrap metal being collected at the Dryden Highway Department, there's no Dryden news on the front page. Instead there are articles about naturopathic physicians and the TST BOCES car show. Briefs note the Thousands of One visit to Dryden Central School auditorium next Wednesday at 7:00pm, and that Dryden Seniors will be meeting Monday, June 12th, at the Dryden Fire Hall for lunch. John Evener will be "playing, singing, and yodeling classic country songs." Dinner starts at 12:15pm, though seating opens at 11:30am. It's free for members and $6.95 for others. There's also a notice for the Dryden United Methodist Church's rummage sale tomorrow from 9:00am to 5:00pm and Saturday morning until noon. Another notice announces a meeting for anyone who wants to play Modified, JV, or Varsity Football for the Dryden schools this fall. The meeting is mandatory, and starts at 2:30pm today in the High School cafeteria. The sports section includes team photos of the Dryden Boys and Girls Track teams. There's been a dead poplar standing on the far edge of my back yard since we bought the house. 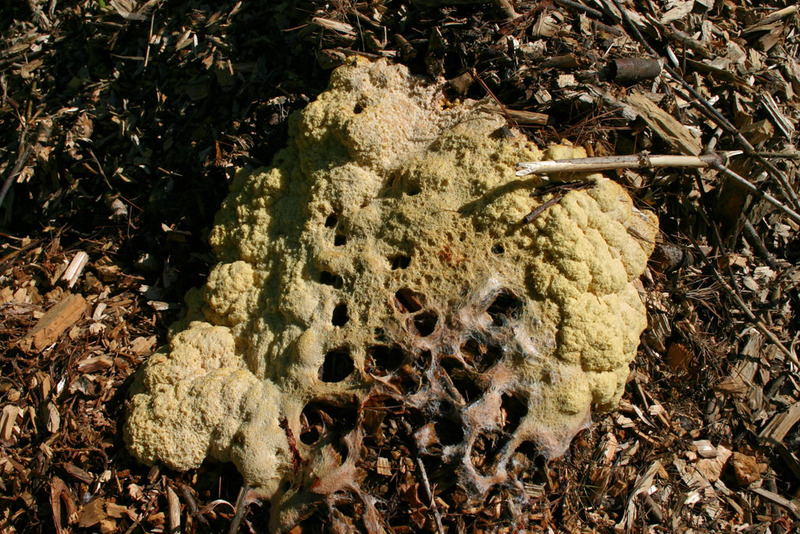 It's been decaying slowly, but today it put on a real show - or at least a visitor to it did. Josh Dolan, who's been working on the permaculture project here, told me I had to come out and see this giant woodpecker. The woodpecker cooperated, staying around for a while as I got my camera and longest zoom lens, and gave me enough time to take so many pictures that some came out all right. 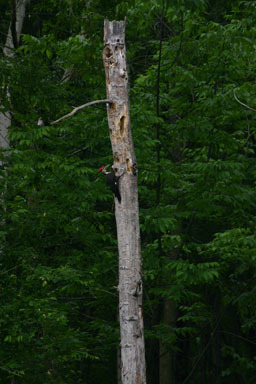 Zooming in on it further, you can see that it's a pileated woodpecker. 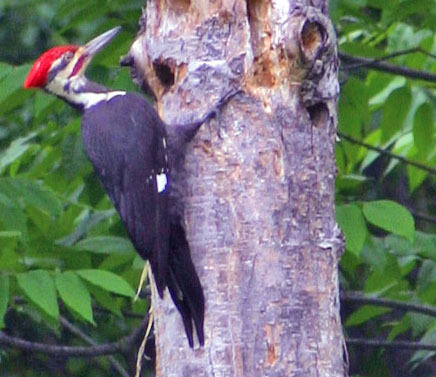 I get downy and hairy woodpeckers at my bird-feeder, but the pileated is a rarer sight. It's a good visitor to have! All four Dryden fire departments plus Lansing and Groton were on the scene yesterday morning at a fire which damaged a house on Wood Road. Firefighters had the main fire out within 45 minutes, and spent another hour hunting down hot spots with thermal imaging equipment. The cause of the fire wasn't clear, but a chicken incubator is a suspect, and the probable lack of fire stops between wall studs may have helped the fire spread. This morning's Ithaca Journal notes that the Town of Dryden will be hosting a renewable energy workshop tomorrow night, this Tuesday, June 6th. The event will start at 7:00pm at the Dryden Fire Hall (map). Presenters will include Gay Nicholson on NYSERDA Energy $mart incentives, County Environmental Management Council chair Steve Nicholson on experience with residential wind and solar power, two contractors on what's involved in installing wind and solar power generation, and Town Environmental Planner Dan Kwasnowski on the town's proposed Renewable Energy Conversion Systems Ordinance. The article also notes tonight's informational meeting at 7:00pm at the Dryden Fire Hall (map), which will look at wind and solar projects more broadly, as well as the ordinance the Town of Dryden is developing. I've been a bit slack on covering Ithaca schools news. Yesterday there was a piece on departing administrators, and today there's a piece on shifting graduation rates for black students at Ithaca High School. I noted a few articles last year on New York State's apparent lack of interest in policing Medicaid fraud, as well as some response by the governor to beef up enforcement. The report, released yesterday by the federal Centers for Medicare and Medicaid Services in the Department of Health and Human Services, said that proposals Gov. George E. Pataki made this year, while commendable, failed to make up for the sharp reduction over many years in the number of state workers charged with policing Medicaid abuse. As proof of how poorly the Health Department had been doing, the report pointed out that total audit recoveries by the department had declined, along with the average amount collected in each audit. In the 2004-5 state fiscal year, just 260 of 140,000 providers were excluded from Medicaid. To the Health Department's credit, the report said, it recently introduced a powerful new computerized warehouse of Medicaid claims that could be used for "data mining" — that is, looking for patterns that might indicate abuses of the system. But health officials have barely made use of that new tool, the report said. The Department of Health refers the most serious cases to the attorney general's office for possible legal action — about 50 a year in recent years, which is far fewer than other states with much smaller Medicaid programs, the Times series said. The report highlighted the low numbers as well, and said the investigative team "questions why the state was not able to generate significantly more referrals than that." 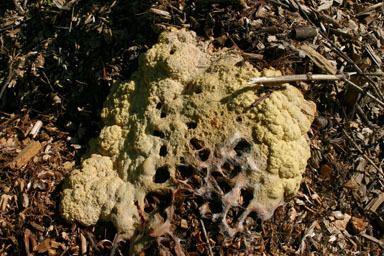 There's vastly more in the article, but overall, it doesn't look good. The efforts the state's made so far to address the problems seem both small and strangely directed, with little interest in actually punishing anyone for committing fraud. A few pieces are caught up in the usual battles between the governor and legislature, but there's a lot that could be done which just isn't getting done. While the garden has seen a lot of work this year, it's also been hosting a rather large number of unexpected visitors. 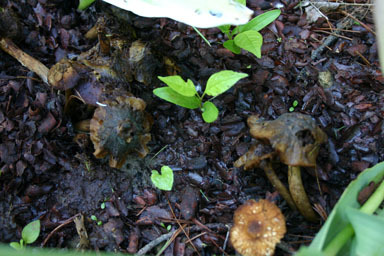 Some of this is because of the large piles of decaying mulch around, and some of it is just because some areas get wet. 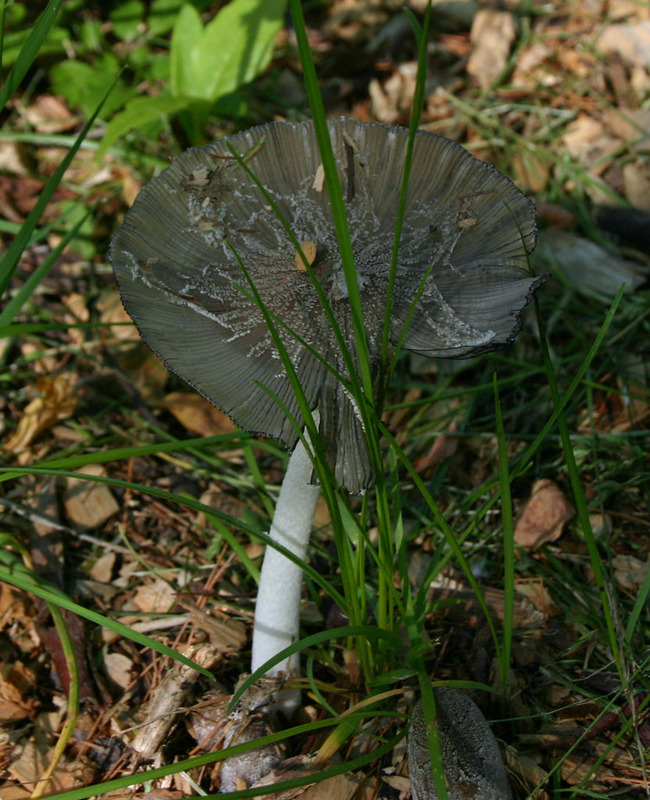 In any case, these are a few of the highlights of this year's "mushrooms and other strange things" collection. Something slimy on the mulch. No, I haven't tried eating any of these, nor do I really plan to. 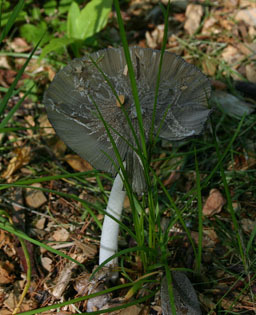 There were a few more kind of mushrooms around, but unfortunately I didn't get pictures of them and they've vanished. Cathy Wakeman's Dryden Town Talk visits the Dryden History House, and recommends its new model airplanes display as a good stop during Dairy Day this Saturday. (There are also some excellent new exhibits on raising chickens in Dryden.) Wakeman also notes tonight's event at Dryden Central School with Thousands of One, the Dryden Elementary performance of "Once Upon a Mattress" tomorrow and Friday, and the Sertoma Golf Tournament on June 30th. Briefly in Dryden notes that the Dryden Swim Team will be raising funds for a new scoring and timing system with a chicken barbecue at Clark's next Saturday, June 17th. 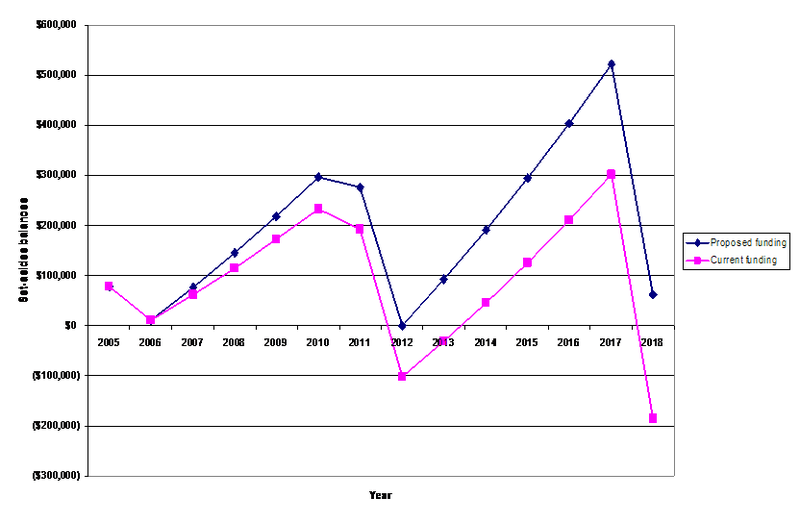 In print, but not online, the Journal reports that Dryden Elementary School made it onto a Higher Performing/Gap Closing Schools, "recognized because during the 2004-05 school year they met all applicable State standards for English and math and also made Adequate Yearly Progress in English and math for two consecutive years. " The Journal didn't take my advice about reporting Democratic and Republican Committee endorsements in parallel, so they give top billing for the candidates Republicans endorsed to candidates in competitive races. Maybe they were just embarassed by their previous approach? Dryden Dairy Day is Saturday! There's lots about Dairy Day in today's Journal, as Cathy Wakeman (who writes Dryden Town Talk) gives an overview of Saturday's event. The print version offers a more detailed schedule, but the two key pieces are the parade down Main Street at 9:30am and the events in Montgomery Park, between Lewis and Library Streets, which run from 10:00am to 3:00pm. There will be displays, a dunking booth, and all kinds of fun. Briefly in Tompkins notes another upcoming event, the June 24th chicken barbecue at Varna United Methodist Church, which will include their 'famous' carrot salad. 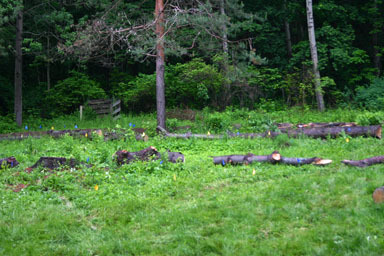 When I had trees cut down in preparation for the gardening work, I had them leave the logs in place. 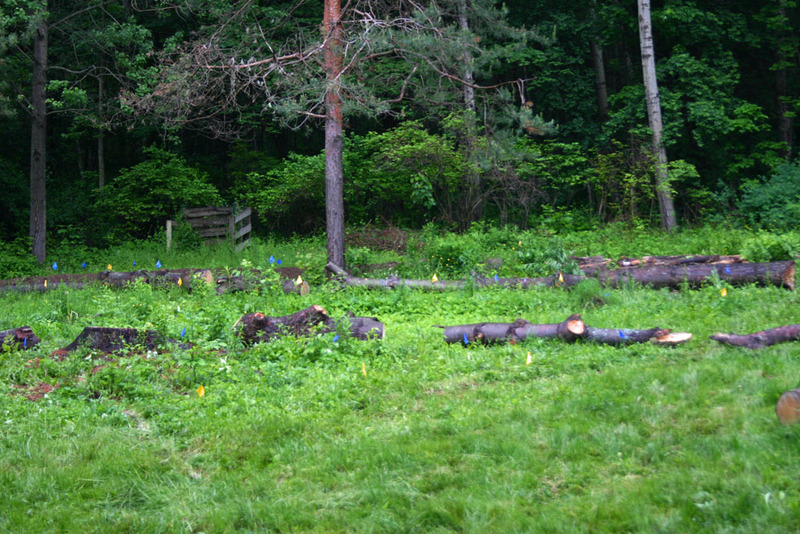 It wasn't pretty - they stayed where they fell - but today we cleaned that up. It didn't even take that long, thanks to a couple of Josh's friends, Chris and Anna, and a very useful tool: a peavey. The peavey is four feet long, with a spike at the end and a large pointed hook coming off one side. The hook grabs the log and the tool gives you leverage to move it. 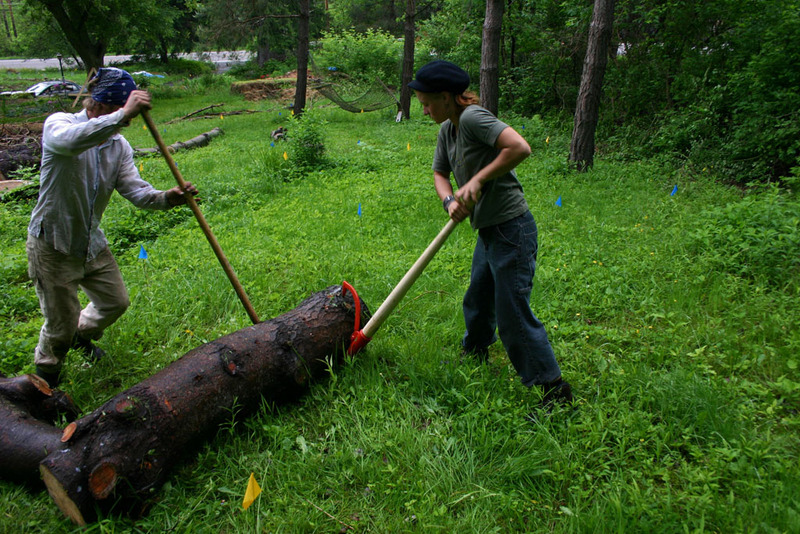 I've seen it described as a "ratchet for logs", and while it's not quite that easy, it's a vast improvement over trying to shove logs around, especially big ones. 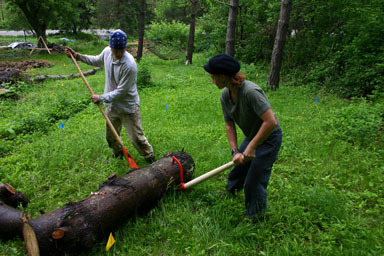 Chris and Anna (who has the peavey) start to move the log uphill. The back yard now looks much more orderly than it did before. Next steps: finish digging a lot of swales, and plowing that large grassy area. I didn't know PTA finances could get this exciting, but the Treasurer of the Freeville PTA was arrested for forging an audit, creating a one-page audit on an auditor's stationery. A picture of students cleaning Ithaca's Stewart Park includes Dryden's Simon Horrocks and Kerry O'Connor. But those drawbacks must be kept in perspective. In the name of progress, the American mind has embraced millions of utility poles, millions of miles of power and cable lines, giant smokestacks, engine and traffic noise, toxic fumes and endless rivers of expensive-to-maintain asphalt. If we do not alter course, the American mind will soon be confronted with vastly higher energy costs, unpredictable climatic shifts and geopolitical tangles that make today's conflicts look like sideshows. Ready or not, the era of lean demand and green energy is upon us. Wind energy is part of that future. It's time we all get our mind around that. One of the big surprises at last night's Town Board meeting was a land purchase and a shift in a grant application. I'd mentioned earlier that the Town had planned to extend the Jim Schug trail only as far as Spring House Road because they couldn't get landowner permission to go further. Last night Town Councilman Dan Tier arrived with a purchase agreement from Warren Van Pelt, allowing the town to buy the railroad bed through his property and put in a trail. Thanks to that, Environmental Planner Dan Kwasnowski will be shifting a grant application to further work on the Dryden-Freeville trail, especially as the grant is looking for 'construction-ready' projects, which it looks like this one now is, at least for a longer segment. I'm not sure if they'll be able to go through George Junior Republic yet, but I think this purchase at least puts them on the doorstep. The downside, at least for those of us on the west side, was that the town had planned to use that grant application for another rail trail through Varna from the East Hill Recreation Way to Route 13. Hopefully that'll still happen eventually. This morning's Ithaca Journal visits Thursday's Town Board meeting, reporting on the improved prospects for the Dryden-Freeville trail. They also note the delays on the final Town Hall plans, the proposal for a Dollar General near TC3, and a Varna Volunteer Fire Company presentation. The front page also reports on a court loss for NYSEG that could result in lower delivery charges for customers, with a separate piece explaining the decision's impact. On the opinion page, Paul Semo of Freeville tries to blur the distinction between government surveillance of telephone calling and credit bureau monitoring. Last year's Dairy Day was sunny and sweltering; today's Dairy Day was wet and cold. Despite that, it was still fun both times. 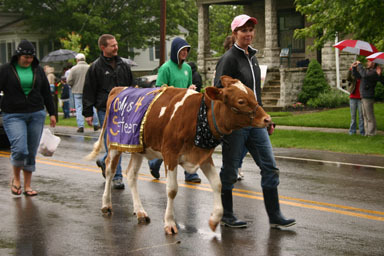 Dairy cow in the Dairy Day parade. 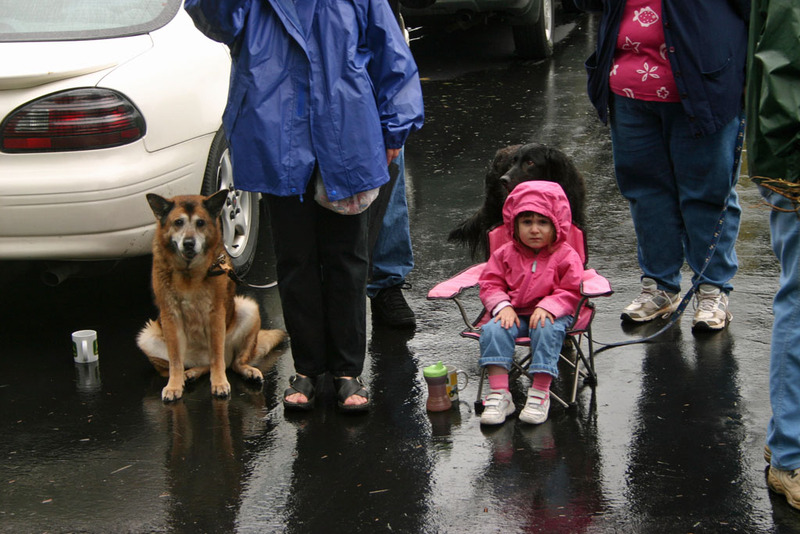 I was in the parade with the Dryden Democrats, so Angelika took all of the photos of the parade (including the ones above). Those pictures, plus some before the parade and a few I took afterward, are in the gallery. I was also delighted to find something else at Montgomery Park: cheese curds made at a local farm, the Produce Pantry of Wideawake Dairy. They had plain, garlic/onion/chive, and horseradish curds for sale, as well as jalapeño to try. Apparently whatever he didn't sell there will be available at Back to Basics on Route 13. I picked up one each of the ones he was selling, and I'm very happy. The horseradish one is especially nice, with just enough horseradish to taste good without blasting me out of my seat. This morning's Ithaca Journal celebrates its new color printing presses with a set of photos from Dryden Dairy Day, including one on the front page of the Dryden Elementary School Recorder Band. The sole gainer was neighboring Tompkins County in the Finger Lakes, where Cornell University, Ithaca College and tourism have boosted the job market. I'm not sure that's exactly an adequate explanation, since I keep hearing about all the amenities younger residents supposedly want, and 'central isolation' isn't usually high on the list. It seems that Tompkins County is becoming a destination for a lot of people, both young and old, perhaps the most attractive part of beautiful upstate New York.. So I guess the question becomes: what are we doing right? And what can we do better? How is this playing out within the county? And is there anything we're doing well that we can share with our neighboring counties? Update: NYCO has comments on the upstate situation more broadly. This morning's Ithaca Journal has a letter from Greg Kimbell of Dryden, extolling the virtues of motorcycles both for miles per gallon (78mpg available!) and fun per gallon. There's also an article on the state legislature's latest attempt to buy votes. The governor vetoed their "rebate checks in October, just before the election" approach, but now the Senate and Assembly think they've found a way to bypass the Governor and send out "rebate applications in September, just before the election." They could, of course, concentrate on permanent solutions to New York's fiscal and other problems, but I suspect they that this will insure that their re-election rates remain historically high, after the very few losses and close calls they had last time. I'm glad to see another blog focused on life in a Tompkins County town, this time at Finding Ulysses. It's pretty different from Living in Dryden, but it's good to find someone else writing specifically about local politics and issues. Two Brooktondale men were arrested for a robbery and burglary committed in Dryden on May 31st, during which shots were fired. The Dryden Swim Team will be raising funds for a new scoring and timing system with a chicken barbecue at Clark's next Saturday, June 17th. The Varna Community Center will have a benefit barbecue to support cancer survivor Kim Rowland on Saturday, July 1st. The Dryden Youth Commission has an opening for another member. Groton Town Talk notes a barbecue Friday at the McLean Fire Department in support of the McLean Community Church. Dinners and halves will be available at 4:00pm. Tompkins County's hiring outlook is brighter than the nation's, but still declining a bit. Although we've done some very large things to my yard and gardens this year, there was still a large area in the back yard that was basically just lawn. After turning a smaller area in the front yard by hand, I wasn't exactly enthusiatic about doing that to a space five times as large. 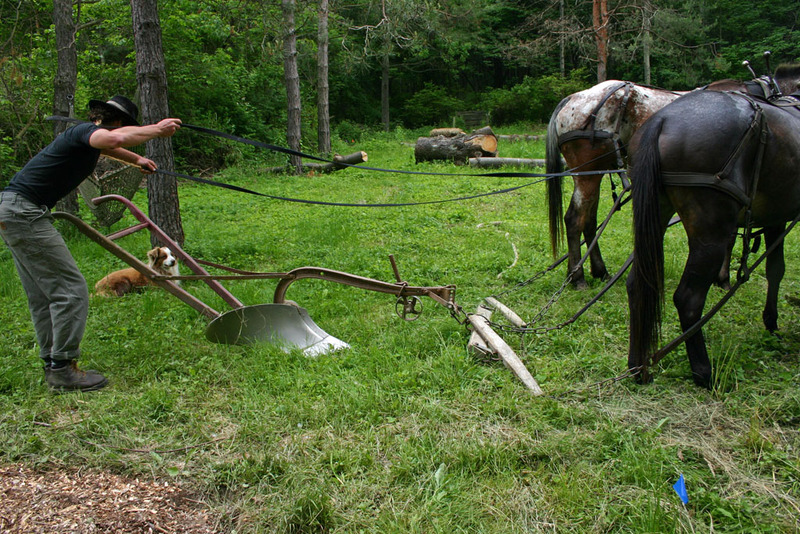 Josh had a friend, Eric Kincaid, with horses and an interest in plowing. Eric apparently plowed a much larger area in Brooktondale yesterday, and came by today to try plowing in my yard. 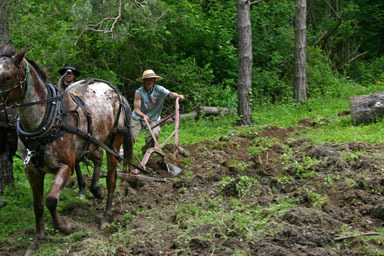 While it may have been a large area for turning by hand, it was a rather small area for plowing by horse. Still, I think in the end, it was pretty successful. The plow was from Syracuse Chilled Plow Company, though I don't know how old it was. 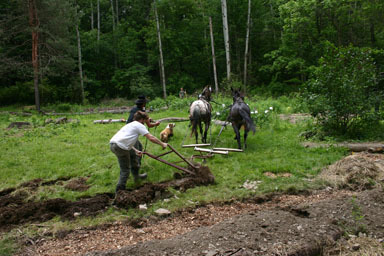 Kincaid's horses were an Appaloosa (Strangely) and a mule (Errata), and his dog Tuffy was there to help - sort of - as well. The horses, which normally pull Kincaid's cart, seemed comfortable pulling the plow. 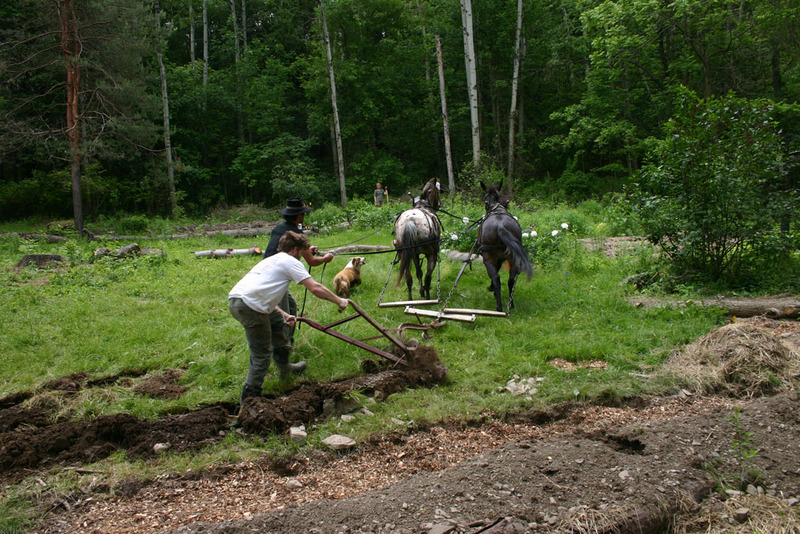 Josh makes a first run on the plow as Eric directs the horses. Chris makes a later run on the plow. It was definitely a pleasure working with Eric and his team, and I'd recommend it, though I think it probably makes a lot more sense if you have at least half an acre to an acre, with space for the horses to turn around. I'd say it was successful experiment, if unusual. 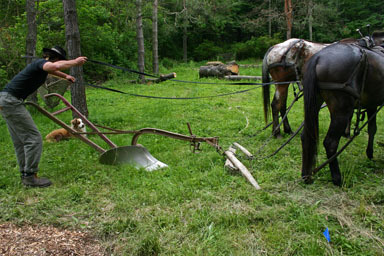 If you'd like to see more, including the horse cart, plow, and more of the horses, I've posted a gallery. Thanks also to the folks over at The Orchid Place for letting us park a horse cart in their lot, and hitch and unhitch horses there. 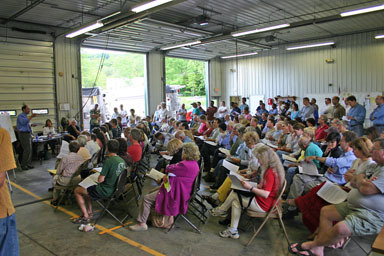 Ellis Hollow residents filled the Varna Fire Station tonight, requiring Varna to make a mutual aid call to the Dryden Fire Department for more chairs than the 99 they already had out. Engineer Andy Sciarabba explained the basics of the interim report to the group, and then Environmental Planner Dan Kwasnowski collected questions. Engineer Andy Sciarabba explains water district options. 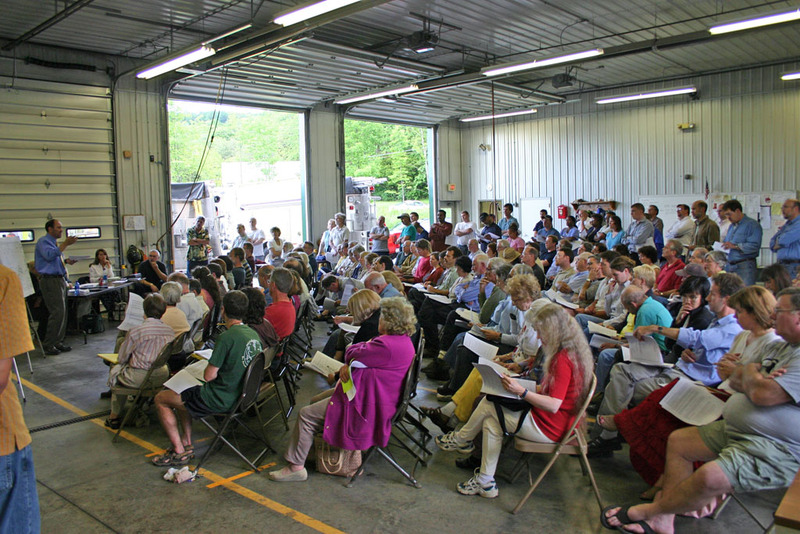 Among the questions were a lot of comments opposing the formation of any district, and finally the Town Board asked for a show of hands among people living in the base area and the extended area who wanted or didn't want water. In the base district, it looked like 2-1 against, while in the expanded area (excluding the base district), there were only four people in favor. Town Councilman Marty Christofferson moved not to proceed with any of the districts, and somewhere in the chaos of people departing the Board passed a resolution to that effect. If you'd like to see more of the action, I've posted a gallery. Now if only people would turn out like that for the rest of the conversations determing how tax dollars get spent! NYCO's Blog highlighted a map showing which school districts face the ugly combination of above average tax rates and lower spending per student. The map comes from the Midstate School Finance Consortium, which is pushing the state for fairer and more transparent school aid rules instead of the strange new package of incredible complexity that arrives every budget year. The map, available here (299KB PDF) appears to show Dryden as one of the school districts that spends below the state average per pupil but still has a tax rate above the state average. 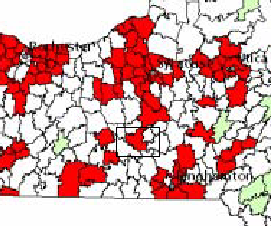 Dryden school district among the red. There's another map in the original presentation above this one showing Ithaca in red as well, and I'm not sure why it disappeared, but Dryden appears to be in red in both cases. I'd like to find more detail about how far above the average Dryden is in taxes and below in spending, and which year this data came from, but the map is a good way to highlight how some parts of the state don't seem to be getting quite the help they could use, while others get more. A number of local schools have already banned the sale of soda to students and reconsidered their daily menus. Newfield schools started providing free breakfast for all students last year, Dryden is considering widespread cutbacks on old standbys like hot dogs and Ithaca is gradually revamping its menu, for example. Local People reports on Dryden High graduate Carolyn Edgecomb receiving an Academic Achievement Award for being the highest-achieving student in her class at the College of St. Rose. Looking just to the west of the town line, the Journal also has some pictures of early morning operations at Tompkins County Airport. This morning's Ithaca Journal reports on the disaster training event held at Holy Cross Church by the Tompkins County Red Cross. The event, which simulated housing fifty people after an imaginary tornado hit Conger's trailer park on Kirk Road, is still going on as I write this. Mike Raffe, the Red Cross Emergency Services Director, gave the Town Board a brief presentation on the event and a letter describing what is involved (47KB PDF). In other local news, TC3 tuition will climb $100, and the Local People section today focuses on the achievements of TC3 students and Freeville residents. 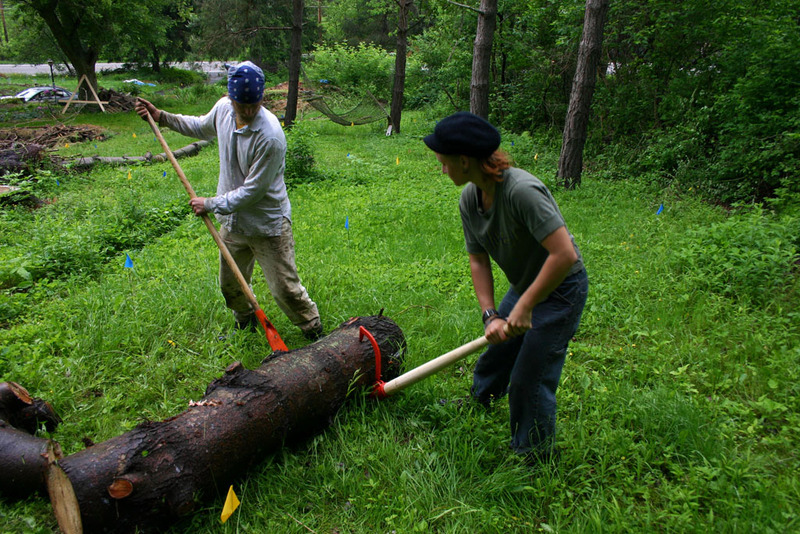 There's also news about local companies, as the county Industrial Development Agency supported RPM Ecosystems' new project growing trees and grasses at 2150 Dryden Road, and allowed Cayuga Press to depart for Cortland without repaying their tax abatements. This morning's Ithaca Journal visits Freeville's Brookside Berry Farm, which just opened for the season a few minutes ago,in an article on U-Pick Strawberries. There's another article about the disaster training at Holy Cross Church that was held this past weekend, simulating an emergency shelter responding to a tornado in Etna. The Journal also looks at a pilot program for screening inmates at the county jail, aimed at helping offenders avoid future crimes (and expensive trips to jail) after their release. Local hospitals got mixed results on a report card, with Cayuga Medical Center having one lower than average mortality rate of seven and Cortland having six of seven lower than average. Full details are available on the Web. Neither hospital made it into the "Honor Roll" in any category. Also, Etna Lane will be closed to through traffic from tomorrow through the end of August between Routes 13 and 366 for culvert repairs. On the opinon page, Yancey Roy explores legislative options for calling the kettle black, chronicling just a few of the ways the inaction blame game can be played in Albany. This morning's Ithaca Journal includes an editorial congratulates the Town of Dryden and Board member Dan Tier for advancing the trail from Dryden to Freeville, finally sorting out a long negotiation with landowner Warren Van Pelt. The Monitor reports on the strange disappearance of a washer and dryer from an apartment building on Keith Lane in Dryden. Varna Volunteer Fire Company's promising future? 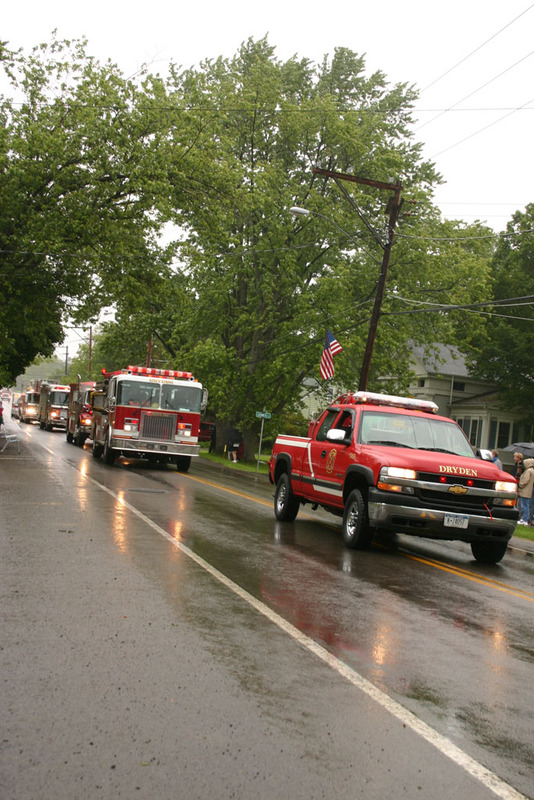 The June Town Board meeting returned to a common topic of Town of Dryden government and politics: the details of fire protection financing. With chiefs from Etna, Freeville, and Dryden looking on, the Varna Volunteer Fire Company presented on the bright news of its present and the potentially darker news of its future. Varna Fire Chief Natan Huffman started the presentation with good news. The territory the VVFC covers is growing, with new businesses developing near the Route 13/366 intersection, there is residential growth, and perhaps best of all the fire company itself is growing: 14 new people coming in last year, 10 of whom are likely to stay, and 6 new people so far in 2006. Call volume has also grown from 200 calls a few years ago to 297 calls last year. After Huffman finished reporting on the state of the department, VVFC Chairman Oliver Habicht spoke about the state of the department's finances. Habicht confirmed the department's embrace of transparent finances (the VVFC very helpfully shared their information with me a few years ago) and talked about how Varna has no village or endowment supporting its finances - just the Town. Habicht walked board members through a presentation on the VVFC's finances (90KB PowerPoint, plus additional supporting material). 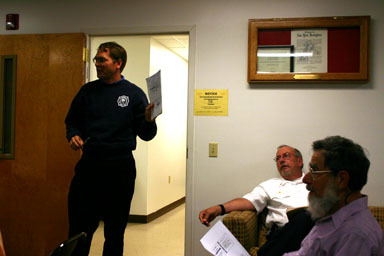 Varna Chair Oliver Habicht talks about Varna Volunteer Fire Company finances while Chief Natan Huffman and Treasurer Harry Kesten listen. Of the VVFC's expenses, 51% are operating costs, 19% miscellaneous capital equipment, and 30% the truck replacement schedule. Fire equipment costs have risen consistently at 6% a year - "safety inflation" - through good years and bad. The VVFC has adhered to a strict policy of paying for purchases in cash, without taking on debt. Unfortunately, its funding model over the last few years was based on less than that, with the Town budget generally increasing their funding by a lower amount, around 3% a year. The place where this has most potential for problems is in the truck replacement schedule, which Habicht pointed out is going to fall into deficit ($102,247) in 2012 and again ($185,479) in 2018. Either the Town will have to find additional money, or the VVFC will have to consider going into debt, raising the cost of purchasing equipment. Fixing this problem is doable - advance planning will make it much easier - but there's a cost. They proposed a $14,661 increase for 2007 - instead of $50,509, $65,170 - and then a 6% annual increase to keep up with prices. They also propose dropping a $5000 annual "matching funds" program, reducing the increase to the overall budget somewhat. This is no doubt going to be one of the bigger questions in town politics over the next few years, and it's a little frustrating that there were only a few people at the Town Board meeting. I'm delighted to see Varna put this amount of information out to the public, and hope it might start a new phase of open communications about the fire protection needs of the town. I'm also happy to see them planning ahead, and hope the Town can avoid the habit of one-time expenditures that make fire taxes leap up suddenly, or debt service that increases them permanently. Like so many patterns of population movement, what looks like a matter of personal choice is at least partly a response to basic economic incentives — or the lack of them. Young people living upstate seem to have many more choices available to them than their grandparents did. But nearly all those choices involve some other place. What is missing is the one fundamental possibility: to stay home and build a good life where you were raised. We live in a key exception to prognostications about upstate's doom. Dryden, and Tompkins County generally, is growing. There's lots of new construction, and if housing prices are any sign, there should probably be even more new construction. The Times noted this county as an exception to the departure of 18-34 year-olds last week. I think the 'why' of what's going on here is more than the economy. We have universities and colleges, sure, but so do lots and lots of places in upstate New York. We definitely enjoy a more stable economy than surrounding areas, without Corning's dependence on Corning, Inc. or Binghamton's recent defense contracting boom, but I can't say the economy overall is growing drastically here. 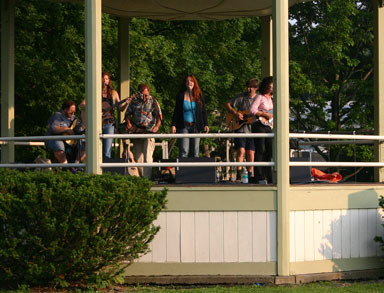 It's hard to give a simple reason that Tompkins County is a very attractive place to a lot of people, making perhaps too many of the "Top 10 Places to Do X..." lists. At the same time, I get a strong sense from conversations here that a lot of people do leave Tompkins County - we're just enjoying more arrivals than departures. I'm not sure there's a good way to figure out what the patterns are. So what are we doing right? And wrong? In this morning's Ithaca Journal, Cathy Wakeman's Our Towns column looks at the Dryden Grange giving Simon Horrocks their Fay Ballard Scholarship, noting his work in the TST BOCES New Visions Agriculture and Environmental Sciences program. The course included founding an FFA chapter, and internship in plant pathology, and time on a pheasant farm. 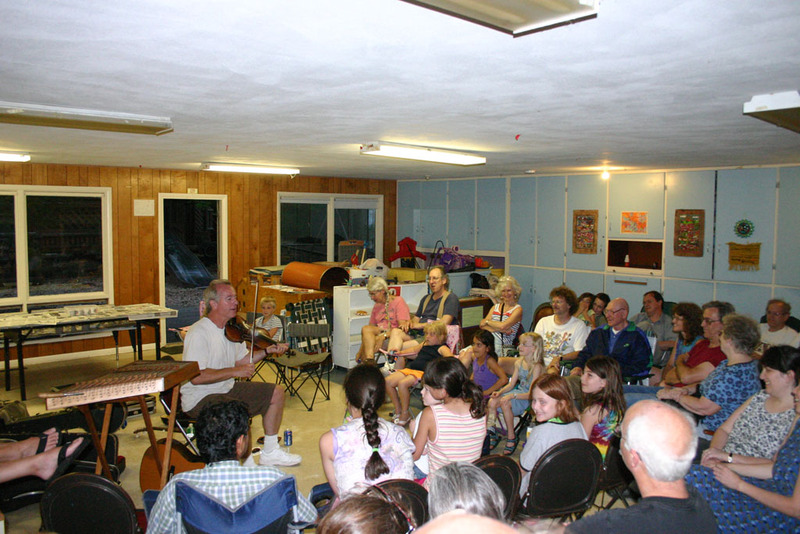 Wakeman also notes a a chicken barbecue at the Varna United Methodist Church this Saturday starting at 4:00pm, as well as the Master's Puppets at Dryden Baptist Church next Friday at 7:00pm, and the Dryden Community Bible School. The last, which runs from 6:30pm to 8:30pm June 25th to 29th, is sponsored by a wide array of churches: Dryden United Methodist Church, Dryden Presbyterian Church, McLean Community Church, Holy Cross Catholic Church, and the Dryden Assembly of God. It also looks like Assemblywoman Barbara Lifton will have a challenger this year, Republican Jim Rohan of Ulysses. On the opinion page, Avery E. Park Jr. writes an open letter on immigration to President Bush, writing that "All the citizens I know want America to maintain its old fashion integrity... Mr. President, why is it you don't sense the very realistic fears of your people's thinking that America is being attacked and being taken over by an unarmed enemy." Also, on the opinon page is one of the best editorial titles I've seen in a long time: State tax rebate: Keep the money and buy a clue. I also love the content, which explores how the state legislature seems intent on distracting voters from Albany's real problems by handing out cash. I've heard Richard Florida's "Creative Class" theories posed repeatedly as a way, perhaps the only way, to revive parts of the country, perhaps even here, that have fallen on harder times. Generally, I think they're ridiculous, more of a grasping at straws ("if only we had some rich smart people here!") than a realistic solution. How many advertising executives, artists, writers, editors (yes, that's me), and similarly cultural folk does the world really need? I like his example a lot. I should: my team and I have actually worked a lot in parts of this region, especially Syracuse, Ithaca, and Corning. I think we can do more than disaster relief. This is why I developed my theory and approach. I think it provides some real levers that communities can push on. In this region, I have to say, some remedial training on tolerance would be useful, but only to some extent. There are other even more pressing things that need to be, and are starting to be, done. I could go on and on about this, but I propose another approach. I am going to try to get the leadership of the region to comment on how and where our approach and work helped them and, conversely, where it did not. Hrm. He apparently hasn't looked back at the places he's been yet (bad consultant! ), and I'm not really sure how exactly to give a region "some remedial training on tolerance." I'm not saying becoming more open and tolerant would save the day, but it would create a social climate more open to immigrants and young people, as well as other groups. This seems to be about the same proposal as old-style urban renewal: encourage the people living there to leave, and then replace them with other people you hope will improve property values and tax revenues. Thankfully, there is at least one sort of sane voice here, as Frank Levy suggests improving education. Of course, he also seems to be suggesting it as a means to draw in more outsiders, but at least it's something which (at least usually) has benefits to everyone. Tompkins County - and Dryden - feels to me like a mixing bowl, a place where newcomers have always passed through and a permanent population has stayed. I also worry about people leaving here, and marvel at the influx of newcomers, but I get a strong sense that what these supposed experts are talking about is building a transient economy, not a community. I've only lived in Dryden for seven years, true. My job puts me somewhat out of the local economy. 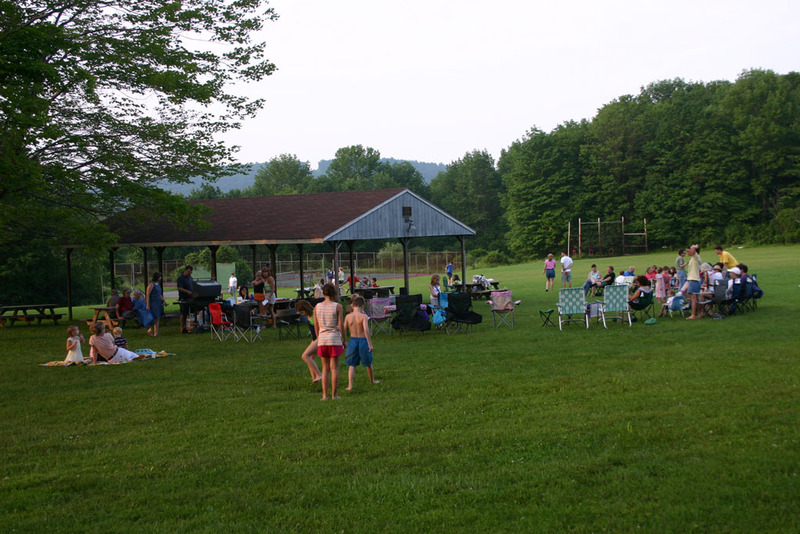 The reason I live here, though, is that there is community - and one built on a sense of place - in upstate New York. It's not just a pass-through zone of people from everywhere who stay home watching TV because they don't know anyone else in the area. I don't think Florida or his cronies get this. All they seem to see is the short-term promise of more dollars flowing into places as they import a historically privileged class of workers with greater mobility than most. They don't seem to care, for instance, that this class of people isn't exactly renowned for its ability to mix with other groups, or that their very mobility makes it easier for them to wander elsewhere whenever the next great thing comes along. Maybe we should put up signs at the county boundaries: "Tompkins County: Come for the Opportunities, Stay for the Communities." There isn't much about Dryden specifically in today's Journal, but there's all kinds of information about happenings just beyond Dryden's western edge. Near Sapsucker Woods, Rocco Lucente wants to finish his giant subdivision by extending Birchwood Drive, Birchwood Drive North (soon to be Beechwood Drive), and Santuary Drive to create 47 new residential parcels. I used to live in a little house behind a house at the end of Birchwood, and I'm sorry to see those woods go, especially given the kind of houses Lucente's been building there lately. (They aren't cheap to rent, either.) Hopefully it won't be quite as awful as Briarwood Drive and Sanctuary Drive are now. In good news, he plans to donate 25 acres to the Lab of Ornithology. There was a dedication yesterday for the renovations of the senior housing on Ellis Hollow Road, again just west of the Dryden line. Around noon, a B-17 will likely fly over Dryden on its way to the airport, where it will be on display until June 30th at East Hill Flying Club. There are also articles on Ithaca High School and Lehman Alternative Community School graduations. Dryden High School commencement is tonight at the sports complex by the high school. This morning's Ithaca Journal reports on last night's Dryden High School graduation, held in the gymnasium. Darts & Laurels include a couple of Dryden-related pieces. Anne Grant thanks Ray, Rita, and Brent Harris for their care of Green Hills Cemetery, and Leslie Fisher of Dryden High School gets a thank you from the Ithaca Sciencenter for her work as one of the Chemsations. 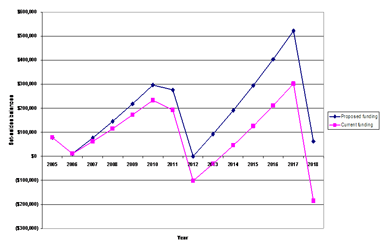 In county news, Elia Kacapyr reports that the Tompkins County economy in 2006 so far looks a lot like 2005, slipping a bit in April, and the County Legislature is examining long-term capital projects. At the state level, lawmakers binged in a final round of deals before summer break. I hadn't noticed until just now, but sometime last month the Brennan Center for Justice started a blog on the need to reform New York State government. Excellent reading, highly recommended. Sorry - comments turned off because of spam. Yesterday's heavy rain undermined a basement on Foot Hill Road and toppled trees on Genung Road. I was a little surprised here to see my birdfeeder had fallen over, but this was the first good rain since I put it in, so I guess I just need to put it in again. Briefly in Tompkins also notes a meeting to be held tomorrow night at 7:005:30pm (sorry!) at the old Dryden Town Hall (map) to discuss the new Dryden Town Hall's construction. Fortunately, the worst of yesterday's weather avoided Dryden, though it damaged Old 76 Road in Caroline and has closed Tioga County roads. There's an article on Freeville resident Rachel Dickinson's latest writing venture, a children's book called Tools of Navigation, which just won the American Society of Journalists and Authors competition for 2006 Best Children's or Young Adult Book. 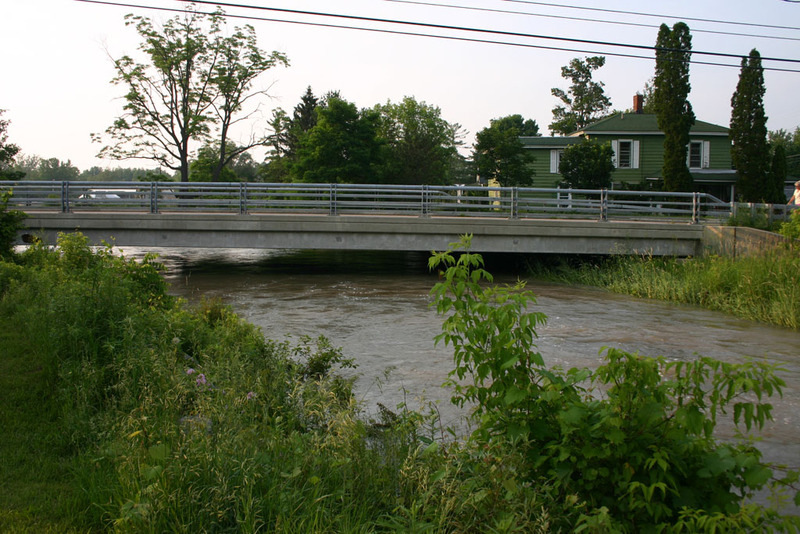 Briefly in Tompkins notes that the Tompkins County Highway Department will have an information meeting on the reconstruction of Ellis Hollow Road at the Ellis Hollow Community Center on Genung Road, starting at 7:30pm on Wednesday, July 12th. could have happened here. We were very lucky that Tuesday's rain wasn't worse here than it was, but other places weren't so fortunate. Places to the south and east of Dryden are severely flooded, with part of Interstate 88 completely washed out, much of Binghamton underwater, and damage all over. The print version of today's Ithaca Journal reports on the Tompkins County Red Cross' work to help other counties and repairs being made in the Town of Caroline. The Journal also reports on Saturday's Varna barbecue to benefit cancer survivor Kim Rowland. We'll be serving from 3:00pm to 6:00pm at the at the Varna Community Center (map), and the Ithaca Breast Cancer Alliance will have a booth there. TC3 is helping keep Cayuga Medical Center staffed with nurses, and the editorial looks at 50 years of the airport, just west of the Dryden line. I missed last night's meeting about the new Town Hall because I thought it was at 7:00pm, and it really happened at 5:30pm. Oops. Town Clerk Bambi Hollenbeck had a good idea, though, that I should check out the Music in the Park events at Montgomery Park and Ellis Hollow Community Center. 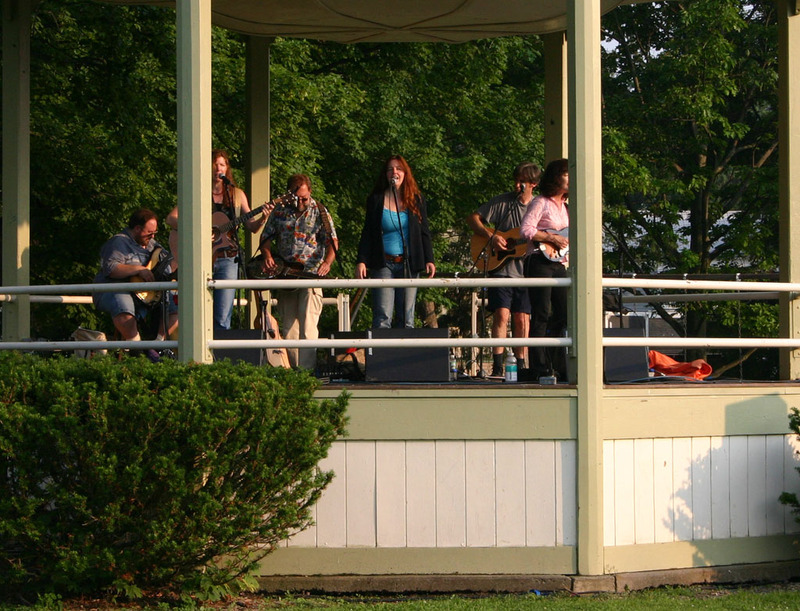 At Montgomery Park, the Burns Sisters were kicking off the series to an appreciative audience. I asked Town Recreation Coordinator Jen Dube if there was still time to see Mark Rust at Ellis Hollow Community Center, and she said he hadn't arrived yet - he was stuck driving because of the floods between here and Woodstock. On my way over, Virgil Creek looked high, though not so high as to be threatening. Dryden escaped the worst of Tuesday's rains, but I'm guessing the flood control system may also have helped. Virgil Creek under Route 13. At Ellis Hollow Community Center, people seemed to be waiting in pretty good humor. There was a nice crowd of people still there when Rust arrived at around 8:20, six and a half hours after he'd set out on what is normally a two and a half hour trip. Waiting crowd in Ellis Hollow. Just as Rust arrived, stormclouds and wind appeared,with a sudden drop in temperature. The group shifted into the Ellis Hollow Community Center building, where Rust delighted the crowd with an enthusiastic show despite his difficult drive. Mark Rust plays the fiddle. It was an amazing night, though definitely not the meeting I'd expected. This morning's Ithaca Journal includes a report on ways Tompkins County is helping out flooded areas to our east, as firefighters, the Red Cross, stores, and others helped out. Dryden sent a fire truck and ambulances. It looks like there will be a three-way race for Sheriff, as Tim Little wants to run as an independent, challenging incumbent Democrat Peter Meskill and Republican Brian Robison. On the opinion page, there's a letter from Kathy Zahler of Freeville discussing barriers the Town of Dryden has put in the way of residential alternative energy. It looks like the Journal sat on this letter a long time, as it cites a May 4th article. There's also a guest column from Assemblywoman Barbara Lifton about the Fair Share for Health Care Act she co-sponsored. The bill doesn't seem to have passed in the last session, though there was a lot of discussion about it earlier this month.